In this episode, the listeners scare the listeners with their haunting true tales of their real ghost experiences and then we cover some history of three Halloween traditions or symbols! One of the lasting symbols of the Hallowe’en season is that of black cats but why would these seemingly innocent animals be connected to the creepiest time of the year? The ancient Egyptians believed that all cats were divine creatures with magical powers and as such, worthy of being worshipped. Sacred cats were kept in a special sanctuary and tended to by priests who would watch them day and night looking for omens and prophecies of things to come. Every little twitch or move of a whisker, could be interpreted as a prediction of the future. Cats were also believed to prevent the spread of disease. This was no doubt due to the fact they hunted the vermin which even in that day were seen as carries of illnesses. So great was their reverence that the peoples of that time told tales of a cat-headed goddess called Bast (or Bastet in some records). She would give great blessings to those in her favour but her wrath was so great that she was one of Ra’s avenging deities who would punish the sinful and any enemies of Egypt. Cats were Bast’s totem animal. It was the Druids who first began associating cats with dark forces. Often times a cat will exhibit strange actions like seeing something that is unseen or batting at nothing in the air. This coupled with their amazing ability to see well in near darkness has created the myth that cats can see spirits or ghosts. They believed some humans through use of evil powers were able to shape shift into cats. Many cats were burned during Samhain to rid the world of this evil. (During witch trials, cats were often tortured and killed by Christian puritans along with the supposed witches. Some thought that witches had this ability to change shape into a cat). For a long time in Europe pagan religions such as witchcraft were the dominate belief. These religions were tightly associated with the animals of nature, including the cat. During the rise of the Christian religion in Europe, the church decided that witchcraft was evil and since they attributed cats to witches, cats were deemed evil by association. Cats were considered witches’ familiars. A familiar is a low ranking demon assistant to a witch. Although they could be any colour, the connection to these cats being black is thought to stem from witches working their magic at night (on top of the fact that cats are nocturnal hunters). The cats would appear dark no matter which color they actually might be. Since the time of primitive man, black was a color associated with the night...a time of day they truly feared. That association persists to this day with some people. A black cat crossing one's path by moonlight means death in an epidemic. If a black cat crosses your path while you’re driving, turn your hat around backwards and mark an X on your windshield to prevent bad luck. If a black cat walks towards you, it brings good fortune, but if it walks away, it takes the good luck with it. A kitten is born in May will be a witch's cat. A black cat seen from behind foretells a bad omen. If you find a white hair on a black cat, you will have good luck. A strange black cat on your porch brings prosperity. If a black cat crosses your path, you will have bad luck. If a black cat crosses your path, you will have GOOD luck. (England & Australia) King Charles I of England owned a black cat and the day it died he was arrested. An old sailor’s legend said that meeting cats in the shipyard meant an unpleasant voyage of storms or other bad luck. In Scottish folklore, a fairy known as Cat Sith (a giant black cat) was believed to have the ability to steal a dead person’s soul before the gods could claim it. This led to the creation of a night and day watch (called the Late Wake) where friends and family would guard their deceased loved one’s soul using catnip and “jumping around a lot” to scare of the soul-stealers. In Japan the Maneki Neko (Beckoning Cat) is considered a symbol of good luck. In Russia, their Russian Blue breed of cats are supposed to be good luck as well. In Latvian tradition, black cats embody the spirit of Rungis, a god of harvests, which is good luck for farmers to have around. In Babylonian folklore a curled up cat on the hearth is seen as similar to evil serpent. Thought to have nine lives, so aligned with the symbolism of nine, a lucky number. Some believe black cats are witches in disguise. During the witch-burning era of the 17th century, witches’ cats were put into baskets and burned alongside the witches. A cat on a grave meant that the buried person’s soul was in the possession of the Devil, and if two cats were fighting on a grave, this signified the Devil and the defunct person’s Guardian Angel fighting for his/her soul. Fisherman’s wives kept black cats while their husbands went away to sea. They believed that the black cats would prevent danger from occurring to their husbands. To meet a black cat at midnight is to meet Satan. The Celts believed to kill a cat brings complete misfortune, while to tread upon its tail is also considered unfortunate, but in a less degree. If a black cat suddenly abandons the house of its masters, there will be a great disaster in that house soon. Seeing a black cat in your dream could represent bad luck or a warning of something unfavorable that may take place in your life. Killing a cat in Egypt was a heinous crime, punishable by death. When a household cat died mourning rites were performed for it. Stray cats were treated with honor and fed, and the household cat was allowed to share the family’s food. Cat amulets were produced and elaborate cat-sized sarcophagi crafted for cats who had died, who were often embalmed as humans were. While it may seem unhygienic given what we now know about communicable diseases, the traditional take on the practice of bobbing for apples seems to have come from Roman roots. 1) There is no doubt that the apple itself played a significant role in the “harvest festival” that emerged as the Romans adopted Celtic and other rituals. 2) The apple was seen as representing the goddess of fertility, Pomona. When sliced in half, the seeds form a pentagram, the symbol of fertility. 3) The process of “bobbing” for the apples either on a string or in a container of water, was seen as a foretelling of future marriages. The first to bite into an apple was believed the first who would get married. 4) Young adults and families from near and far would come to the fall festival in hopes of securing their family’s survival. Keep in mind that life expectancies and family security were highly dependent on young people marrying early and having many children. The ability of an apple to predict your future love life seems uncertain at best. The fact is that sticking your face into a vat of cold water seems like perhaps one of the least romantic activities I can come up with, not to mention one of the least sanitary. I especially shudder at the thought of all those runny noses at the end of October getting shoved in as everyone tries to bite into an apple. Seems more like a cesspool to me, but my opinion may be somewhat jaded. I expected to find in my research some correlation between “witch dunking” and bobbing for apples and was happily surprised to find nothing of the sort. A cauldron is a large potbellied kettle with an arc shaped handle. They are used for cooking and or boiling over an open fire. Most modern cauldrons are made from cast iron. However throughout history cauldrons have been made of many different metals. A cauldron dating back to the first century BCE and made of silver was found in Denmark in 1891. It is believed that it was made by Thracians, but people remain confused on the issue because it does contain Celtic pictures on the plates on the sides of the pot. You can find many references to cauldrons in mythology. In the Welsh tale of the Cauldron of Dyrnwch the Giant, the cauldron is said to be able to tell the difference between brave men and cowards. The cauldron would not boil the meat of a coward, but would boil quickly if the meat belonged to a brave man. Norse mythology tells of Odin who was said to have received wisdom and intuitiveness from a cauldron. In Western culture cauldrons have largely fallen out of use as cooking vessels and gained an association with witchcraft —a cliché popularized by various works of fiction, such as Shakespeare’s play Macbeth. In fiction, witches often prepare their potions in a cauldron. Also in Irish Folklore, a cauldron is said to be where leprechauns keep their gold and treasure. In Oak Creek Cemetery in Battle Creek, Michigan there is a statue of the Virgin Mary that stands at the family plot where Johannes Decker was buried. She is believed to have committed suicide or one tale claims that she killed her children and herself. Her eternal punishment is to weep throughout eternity. Those tears seem to come from the Virgin Mary statue. She is called Crying Mary and many people claim that when they touch the visage of the statue, it is damp with tears. This supposedly happens on Sunday evenings at midnight. The statue during the day does appear to have the tracks of tear stains. Linda Godfrey, who covers Weird Michigan among other things, claims that it was not just something that occurred on Sunday nights. She claims that tears ran down the face anytime they visited. This happens regardless of what the weather is like and the tears seem to flow, so that it could not be dew causing it. To us, the statue looks more like a Greek or Roman goddess rather than the Virgin Mary, but that is what legends are all about. The idea that a statue could actually weep certainly is odd! On this day, October 27th, in 1939, a murderess named Winnie Ruth Judd, was reported to have escaped from an insane asylum in Arizona. Winnie had been a nurse, but got involved in drugs. She attended a wild party with two other women she knew through her nursing position, Agnes Leroi and Hedvig Samualson. In a drug fueled fit of passion and jealousy, she shot both women dead. After killing them she dismembered them and placed them in two suitcases, intending to travel on the train with the corpses. How she planned to hoist two dead bodies around is a mystery. The bodies were discovered when blood seeped through the suitcases onto the ground. Winnie Ruth Judd was a repeat escapee from the asylum and through her manic intelligence she managed to evade the police. On this occasion she did finally turn herself in to the cops. Cemeteries have always carried a mystique about them and many people expect them to be haunted. For the most part, cemeteries are very peaceful places. After all, why would the dead want to hang out with the dead? Most haunted cemetery stories consist of an apparition returning to their plot or a hitchhiking ghost being dropped off outside of a cemetery. But Maltby Cemetery is different. Rumors of Satanism and thirteen steps to Hell have given this cemetery quite the reputation. Is it just a place where teenagers go to hang out and drink and act stupid or is there truth to the legends? Join us as we explore Maltby Cemetery! Maltby Cemetery is located in Paradise Valley near Maltby, Washington. The town of Maltby was first settled in 1887 and was named for real estate developer Robert Maltby. 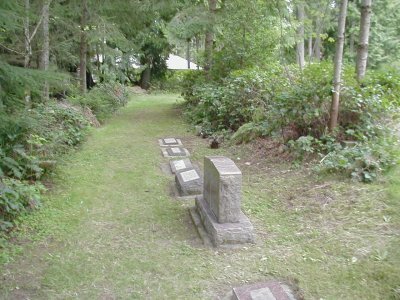 The cemetery is sometimes referred to as the Paradise Valley Cemetery. It contains the plots of some of the original homestead families to come to the area. The first burial was in 1908 of Henry Davis and the bulk of the burials belong to the Doolittle family. The last burial took place in 1985. The cemetery was restored in the 1990s and the land around it developed. The cemetery is on private property and hard to reach, but very well maintained and seems to be a nice peaceful spot, but the legend that has developed around this graveyard is anything but serene. The legend claims that there was a gate here called the Gates or Pillars of Hell and that there are thirteen stairs that began at ground level and went down underground, so that people could see into the crypt at the bottom. The plot had belonged to a wealthy family. The legend includes information that this family practiced Occultism and Satanism. People who travel down the stairs claim that all sound dissipates and they are surrounded in silence. As they travel further down the steps, their lives seem to flash before their eyes and when they turn around at the bottom, they see themselves in Hell. It is a horrific vision. The people who would witness someone travel down the stairs say that they would see the person stop at the bottom, turn around and then collapse in horror. Rumors maintain that several teenagers were carried out comatose and that they never did recover. Some witnesses claim that people disappear as they get further down the stairs. From what we have pieced together, the steps are more like concrete slabs that are on the side of a hill and may not actually exist anymore. Supposedly they were bulldozed or filled in with cement. The cemetery had become a place for teenagers to party and trash and so it would be easy to believe that the private property owners would want to get rid of anything that would attract idiots. And anyone who wrecks a cemetery is an idiot. Many people who attempt to visit now are unable to even find any stairs. We did watch a video of some people trespassing at night and there is the sound of moaning that is creepy. We're not going to post the video because we don't believe in trespassing, but if you google it, you'll find it. Some visitors claim that the gravestones themselves change. They seem to get larger over time. One in particular becomes an ornate, impressive giant. There are claims that there is a place here called The Den and was just after the front gates or in a nearby woods. It is said to be a portal protected by magic and that anyone who tries to enter will go mad. The cemetery also has its own ghosts. There is the ghost of a mother looking for her child and a mother and child ghost who appear poor and unwell. There is also the sound of whispering and orbs floating through the gravestones. There are also reports of ghosts attacking visitors to the cemetery. "Back in 1983 our Friday nights were , get beer and go someplace to drink. The place of the night was Maltby. We had heard all the stories and I have had my share of ( sightings ) . If you are open to the other side, you are more prone to be effected by it. I didn't feel good about going to this place, gut feeling. And I'm not one to get scared, I'm the one jumping into anything to check it out. But not this time. As the guys drank there beer and my girlfriend and I stayed in the van, it was apparent they meant to freak us out. They dared us to cross the metal pillars. Anyone that has been there knows what I'm talking about. On that note, we agreed. My girlfriend and I held hands, said a prayer and took three steps in past ( the gates to hell ) which was as simple as walking past the two pillars. How hard could that be ? Wrong. the air turned very misty, all sound was gone. We didn't hear a thing. At the same time without saying a word we turned to see the guys, they were yelling we could tell but we couldn't hear a word they were saying, we than heard noises from the grave sites to our left, at that point we both took off to run out, and like the movies, our feet wiped out and we hit the mud and beings as scared as we were and so close to the pillars we didn't even bother trying to stand we crawled back past the pillars. The moment we passed back, there was sound to the air and we heard the guys. We got up and ran to the van and insisted leaving ASAP.We couldn't at the time tell them what we felt, but it was clear they didn't have anything to do with it. I have never felt such evil before nor do I ever want to. I grew up with ghosts in our home but not like that. There have been many people that traveled to that place, it was the ( High School ) thing to do. Some people felt what we did, some just had a good time and didn't see or feel anything. But the fact is, its a very evil place. From the minute you leave the main road to go up the gravel, its not a good place. I never went back, but heard they have cleaned it up a lot, repaired it, ( its not the same ) there were stories they had many spirit guides try to put the souls to rest. There were cars that were said to have been chased out of there by devil worshipers and crashed on the hillside. The story is you could still hear them screaming if you listened. That I didn't sit around to hear. But they were said to have taken the cars out years ago. Not going back to find out!" Another tale recounts, "My girlfriend and I wanted to see this for ourselves. You have to go down those thirteen steps and then you see a little chair. If you sit in the chair, it automatically mean that you have sold your soul to the Devil. It sounds really creepy. I was at church with my friend and his pastor said that he went there when he was sixteen and it was the worst experience of his life." Is Maltby Cemetery just a nice peaceful cemetery off in the woods or is it really an area permeated with mysticism? Do the spirits of those buried here wander among the tombstones? Is Maltby Cemetery haunted? That is for you to decide! On the Black Woods Road of Maine originates the tale of a female spectre. When the sun is setting and fog rolls in, many people claim to see the spirit of a decapitated woman named Catherine stalking the road between Franklin and Cherryfield on Route 182. The story of how Catherine lost her head involves a car accident. Or possibly a carriage accident. You see, the legend of Catherine's Hill has many different tellings depending on the decade and the storyteller. People are warned to respect the space where the spectre is seen and are directed to not take anything home with them. If a passerby should see Catherine on the side of the road, they must attempt to pick her up or she will curse them. It is said that one young man sped past the apparition and when he looked in his rearview mirror, he saw Catherine sitting in his back seat. He ended up crashing his car and dying. How do people know he saw Catherine? Well, that is what legends are all about after all. Many people claim to feel a presence and one TV reporter who visited the area for a story remarked that something was pressed against her back the whole time. Now that certainly is odd. The Light Brigade was a British Calvary made up of the 13th Light Dragoons, 4th Light Dragoons, 17th Lancers, 8th Hussars and 11th Hussars. They were facing Russian forces. And unfortunately, in the fog of war, orders were either miscommunicated or misunderstood and the Light Brigade, which was suppose to pursue a retreating Russian artillery, instead went for a frontal assault on a different Russian artillery that was well positioned and much larger. As the poem describes, the small force was surrounded and shot at from all sides. The casualties were high and the small division was forced to retreat. While historians have argued for decades about what really happened, there is no doubt among any of them that the Light Brigade showed true valor in facing an obvious outcome. Most people assume the lore of vampires that originated in Europe, stayed in that area, but there was a time when America was embroiled in the middle of a vampire craze in New England. It was the 1800s and the dreaded consumption was wreaking havoc. 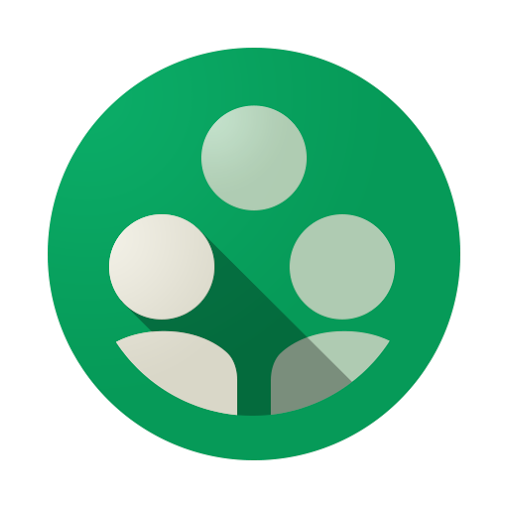 Many families lost several of their members. One of those families was the Brown family. It was the death of one of their daughters that started the Legend of Mercy Brown. Were there really vampires in America and was Mercy one of them? Join us as we investigate the history of this craze and a young woman named Mercy Brown. A few podcasts ago, we covered the Salem Witch Trials. New England was swept up in a craze about witches during that time and it would seem that superstitions still ran high in this area, even after it was apparent that what happened in Salem and other parts of New England was terribly wrong. In the late 1800s, tuberculosis started running rampant throughout the area. The Brown family lived in Exeter, Rhode Island. Exeter was sparsly populated and the Civil War had decimated the town's numbers. Soon something else would lower the population even more. The Brown family consisted of George, his wife Mary Eliza and their children. George was a farmer and well respected, so it was tragic when his wife Mary took ill. By 1883 she had died and eldest daughter Mary Olive was sick. She died seven months after her mother. At the time, tuberculosis of the lungs was referred to as consumption because it took a while to kill its victims. They seemed to waste away as they coughed up blood. The ill would grow pale and stop eating. Eventually, they would look almost like what most people would assume a vampire would appear to look like. One out of four people were dying from the disease. Rumors and superstitions instilled fear that perhaps something other than disease was happening here. And when one family seemed to have more deaths than others, town folk wondered if perhaps a family of vampires was living in their midst. A few years passed and life went back to normal for the remaining members of the Brown family. Everyone was happy and healthy until George’s son Edwin took ill. Knowing what the disease could possibly do to Edwin, George rushed his son to a doctor who recommended sending Edwin to Colorado Springs in the hopes that the mineral water would cure Edwin’s affliction. The climate of Colorado was believed to help cure people with tuberculosis as well. He improved and returned home only to find that his sister Mercy Elena had taken ill.
Mercy was ninteen, but youth was not on her side. She had contracted what had been termed the "galloping" variety of tuberculosis. This meant that the disease moved swiftly. Mercy passed away on January 17, 1892. Her body was placed in a stone crypt awaiting the spring thaw to be buried. This helped preserve bodies. Edwin's disease took a turn for the worse and soon the people of the town started blaming a vampire for the Brown family's woes. They were certain that the vampire was living inside one of the Brown graves. This belief was held in more than just the town of Exeter. At least 80 burials have been found in recent years that appear to exhibit signs that people had been exhumed and their bodies desecrated in some way as to stop them from rising from their graves. Henry David Thoreau mentions an exhumation in his journal on September 29, 1859 to prove the point that this panic was a very real historical event. With Edwin growing sicker and weaker, George was getting desperate. He did not want to lose his son and he started to believe that perhaps the neighbors were right and a vampire was stalking his family. This vile undead thing had to be entering his son's room at night. The only thing to be done was to exhume his family members and find out who was the culprit. Imagine how desperate these people in new England must have been to exhume their loved ones. It was happening all over. Doctor Harold Metcalf joined George in taking part in an old folk remedy. Together, on March 17, 1892, they exhumed the bodies of Mary Eliza, Mary Olive and Mercy to find if any of them were vampires. Mary Eliza and Mary Olive’s skeletons were all that remained. However, Mercy’s body was still fully intact because she had been placed in the cool crypt and it was winter. Decompensation had not really begun. The two men also believe that they found fresh blood on her body. Mercy Brown was the vampire! As was the practice in that day, Mercy's body was cut open and when her organs were found to still be full of blood, everyone was certain that the ritual they were about to embark upon was right. Mercy's heart was removed and burned. The ashes were collected and mixed with water so that Edwin could drink the concoction. It was believed that this would cure Edwin of the vampire attacks and break the spell. Edwin was obviously not cured. Within two months, consumption had taken his life as well. Historically, it is recorded that Mercy Brown was the last vampire exhumation. Newspapers of the day like the Providence Journal reported the story and referred to what was done as barbaric. This seems to have helped stop the practice of exhuming bodies. In Bram Stoker's Dracula, Dr. Seward writes in his diary, "There are such beings as vampires, some of us have evidence that they exist. Even had we not the proof of our own unhappy experience, the teachings and the records of the past give proof enough for sane peoples." The people of Exeter and elsewhere were sane people. They got caught up in a craze. But what they did may have left lasting effects in the afterlife. Desecrating bodies and the emotions around this seem to have led some spirits to hang around, particularly Mercy Brown's spirit. Fun fact: It is believed the story of Mercy Brown inspired Bram Stoker as well and that Lucy is based on Mercy. To this day, visitors of the Chestnut Hill Cemetery in Exeter, Rhode Island report strange occurrences surrounding Mercy Brown’s grave. Stories of seeing the ghost of Mercy Brown taking a stroll along the graveyard are told by visitors. The sound of a young woman crying is heard and even a bright blue light near Mercy’s tombstone has been seen by some guests. Locals say that if you hide behind the tombstone of a man named William C. Johnson and look through the tombstone’s square hole towards Mercy’s grave on a moonlit October night, you may see the ghost of Mercy Brown walking through the cemetery. 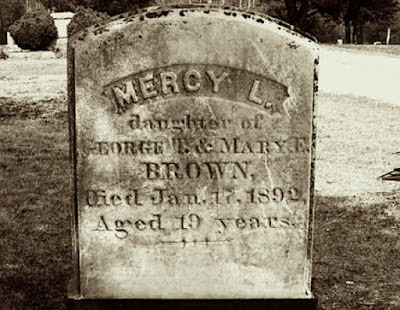 And a tradition has grown around the idea that one can make Mercy appear by knocking on her grave three times and asking, “Mercy L. Brown, Are You A Vampire?” Mercy will appear to you or speak to you. There is a bridge near the cemetery that some claim Mercy visits. The faint smell of roses can be detected when she is nearby. And there are those who are terminally ill that claim Mercy has come to visit them to tell them that dying really isn't so bad after all. In 2011, two teenage girls died in a car accident while on the way home from a moonlight visit to Mercy’s grave along Purgatory Road. Mercy made a quilt that Brown family descendants still have to this day with a pattern that is called the Wandering Foot. A legend claims that if someone sleeps under a quilt with this pattern, then that person will be doomed to roam the earth forever. Surely, Mercy herself had slept beneath the quilt. Is this the cause of her unrest? Were there ever vampires in New England? Did New Englanders allow themselves to get carried away again a hundred years after their witch trials? Does Mercy Brown's spirit still walk among us because of the false accusations? Is she searching for her heart? That is for you to decide! War sometimes brings us some of the strangest stories in history. The year was 1795 and it was a very cold January in den Helder, which was part of the United Provinces. Today, we call the United Provinces, the Netherlands. The French Revolutionary Army was making advances into this area and a group of French Hussars, which is a term used for a light cavalry, were ordered to capture den Helder. Johan Willem de Winter led his men with plans to keep Dutch ships from running to their ally, Britain. When the cavalry arrived, they found a very bizarre scene that was quite fortuitous. Ice had solidified around the Dutch fleet and the ships were stuck. The Hussars quickly surrounded the ships and forced the Dutch sailors to surrender. The fact that a cavalry charge was able to catch a fleet of ships is not only the only time this happened in recorded history, it also is quite odd. On this day, October 21st, in 1833, Alfred Nobel was born in Stockholm, Sweden. Alfred was most interested in literature, chemistry and physics. Rather than being able to pursue a career in literature, he was sent abroad to study and to become a chemical engineer. While in Paris, Alfred became very interested in nitroglycerin and how it could be used in construction work. He worked together with his father to develop nitroglycerin as a commercially and technically useful explosive. Unfortunately, these experiments resulted in accidents that killed several people, including Alfred's younger brother, Emil. Alfred found, through his experiments, that mixing nitroglycerin with a fine sand would turn the liquid into paste which could be shaped into rods. These rods could then be inserted into drilling holes. He named it "dynamite” and he also invented a detonator or blasting cap which could be set off by lighting a fuse. Alfred was able to put up factories in more than 20 countries as the product became very much in demand. He was once described as "Europe's richest vagabond." By the time Alfred died in San Remo, Italy on December 10, 1896, he had over 355 patents. In his last will and testament, he wrote that much of his fortune (approximately 265 million US dollars) was to be used to give prizes to those who have done their best for humanity in the field of physics, chemistry, physiology or medicine, literature and peace. His will was opposed by his relatives and questioned by authorities in various countries. In 1901, the first Nobel Prizes in Physics, Chemistry, Physiology or Medicine and Literature were awarded in Stockholm, Sweden and the Peace Prize in Kristiania (now Oslo), Norway. The Cachtice Castle was once home to Baroness Elizabeth Bathory. She came from a family known for their cruelty to the peasontry and she possibly witnessed incredible violence from the time she was a child. Is this what led her to be called the "Blood Countess?" Was she truly the most prolific female serial killer of all time? Or was she given a bad rap, so that others could have her power and possessions? The Castle is a magnificient structure that may house the energy of intense emotions and pain. Has the energy led this structure to become haunted? Does Madame Bathory still walk its halls? 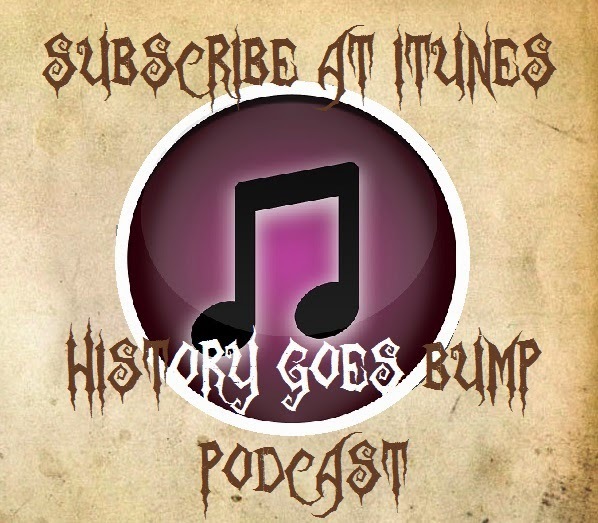 Come with us as we look at the history and hauntings of Cachtice Castle and Madame Bathory. Cachtice Castle originally belonged to Peter and Pongrac from the Hunt-Poznan family. The castle was built in the thirteenth century and is located in the Little Carpathians where it is isolated amongst the hills and its surrounding village is isolated as well. It was built to defend the western end of Hungary. The castle was built on limestone rock and made defensible by the sheer drop on three sides. It was made from stone and mortar, two building materials that do not stand the test of time, and the castle eroded. After it was abandoned, it quickly began to fall into ruin. The top floor was stuccoed on the interior and covered in frescos. A few of those last today. There were four levels with a dungeon in the bottom level. The castle had a connected manor house and though not ornate, it was decorated with fine tapestries and the food was served on plates of silver and gold. In 1392, Stibor from Stibotice took ownership of the castle and he at one time owned up to 15 castles. In 1569, the Nadasy family became owners. We will discuss more about them in a moment. The army of František Rákoczi II burned the castle in 1708. Repairs were made so that the castle could be tranformed into a jail. It burned once again and in 1772 the castle manor house burned as well. The entire complex then deteriorated. An interesting fact about the town of Cachtice is that it had been considered a town at one time, but was downgraded to a village. We had not realized there was a difference. It was through the Nadasy family that Madame Elizabeth Bathory comes into the picture. She was born into Hungarian nobility in 1560 and given the name Erzsebet, which was Anglicized to Elizabeth. She was rumored to have suffered from epilepsy and fits of rage. Count Ferenec Nadasy was a soldier and Bathory was married off to him in an arranged marriage at the age of fifteen. Before the marriage took place, she had a fling with a village peasant and became pregnant. She was hidden away in her family's castle until she gave birth to a girl, who was quickly given away since this was not only scandalous, but the child's father was a peasant. There does not seem to be much of a relationship between the Count and Bathory. He was away at war for long periods of time. Some believe that he taught her torture techniques that were used in battle to get enemy prisoners to talk. Countess Bathory would be bored while her husband was away and pieces of insanity seemed to creep inside her mind. In 1604, the Count passed away from illness leaving Bathory alone in the castle. As she aged, she worried that she would lose her beauty. Wrinkles started to form at the corners of her eyes and mouth. The elasticity of her skin was fading away. For some reason, she started to embrace the idea that youth was connected to blood. Possibly she had heard tales of vampires that roamed the woods and hills of Transylvania. Vampires did not age or die as long as they had blood. And certainly the blood of young innocent peasant girls would be the best. After all, peasants were beneath her station in life. Who would miss them? The call was put out that the castle needed lots of young servant girls and peasant families were all too happy to send their daughters off with hopes that the Countess would educate them and take good care of them. This is not what the legend of Countess Bathory would lead us to believe. Madame Bathory appears to have taken enjoyment from causing pain to others. It is said she beat girls until blood ran, made incisions and pierced their bodies, and used hot irons to brand and burn their skin. Needles were driven into lips and fingernails. Some servants were stripped naked, covered in water and thrown outside into the frosty winter. During warmer temperatures, the girls were covered in honey and secured to the ground so that insects could attack them. The tales are numerous and horrific. But she did not just enjoy torturing the girls. She killed many of these servants, some estimate as many as 650, so that she could drain their blood and bath in it, believing that it would help her skin retain its youthful appearance. She occasionally drank the blood as well leading many to later accuse her of being a vampire. And by today's definition of vampire, she really would have been considered to be one even though she was not dead. But was she truly the Blood Countess? On the 29th of September in 1610 the Viceroy of Hungary, Count Thurzo, was sent with a troop of men to investigate rumours of missing servant girls at the Cachtice Castle. Elizabeth was confined for the night and servants who had served as accomplices were questioned to try and discern what exactly had happened. It is said that under torture, the accomplices told all about the horrors they had witnessed or participated in commiting. The Countess was never put on trial to protect the family's name and keep the property in their hands, but she was punished. In 1611, she was walled up in a room in a tower of Cachtice Castle and left to live out the rest of her days there. There was a narrow slit where only food and water could pass through. Four years later she was dead. She had lived to be 54. Since there is written testimony, it would seem that something did happen at the castle, but these narratives seem almost too extreme to be believed. Could it be that the accomplices were pushed into declaring falsehoods because family members wanted to take the Countess' power from her? The viceroy had tried to have her imprisoned shortly after he became palatine. It was believed that this was because he had his eye on her wealth. King Matthias owed the Countess a lot of money and some believe he conspired to have her framed. Claims that she kept a list of victims have never been proven to be true as no such record has been found. And the lack of a trial is suspicious. We will more than likely never know the truth, but the legend lives on and only continues to grow. A traveler to Cachtice Castle once said: ''With this tale fresh in our minds, we ascended the long hill and gained the castle, and wandered over its deserted ruins. The shades of evening were just spreading over the valley, the bare grey walls stood up against the red sky, the solemn stillness of evening reigned over the scene and and two ravens, which had made their nests on the castles highest towers, came towards it winging their heavy flight, and wheeling once round, each cawing a hoarse welcome to the other, alighted on their favorite turret, I could have fancied them, the spirits of the two crones, condemned, to haunt the scene of their crimes, while their infernal mistress was expiating her murderers by more wretched dooms." So was that just random imaginings or is there truth to the thought that Cachtice Castle might be haunted? Ghost Hunters International did not find any evidence of hauntings in their brief investigation, but ask many of those who have visited the ruins and they will tell you that there is a darkness there. People who walk the ruins claim to get strange feelings in certain areas and to see shadow people. Whether these are shades of the victims or the Countess herself is unknown. Haunting shadow cats are seen and the Countess was known to have pet cats. An urban explorer recorded a weird sounding growl when he was at the castle, but there were no other people or animals around at the time. 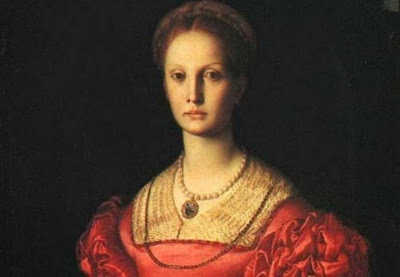 Was Elizabeth Bathory the most prolific serial killer in history? Or was she betrayed and lied about? Does her restless spirit still walk on this side of the veil? Have the spirits of her victims stayed to haunt the place where they experienced inhumane treatment, torture and death? Is Cachtice Castle haunted? That is for you to decide! "Muirhead immediately noticed that the last few days of entries were unusual. On the 12th December, Thomas Marshall, the second assistant, wrote of ‘severe winds the likes of which I have never seen before in twenty years’. He also noticed that James Ducat, the Principal Keeper, had been ‘very quiet’ and that the third assistant, William McArthur, had been crying. What is strange about the final remark was that William McArthur was a seasoned mariner, and was known on the Scottish mainland as a tough brawler. Why would he be crying about a storm? Log entries on the 13th December stated that the storm was still raging, and that all three men had been praying. But why would three experienced lighthouse keepers, safely situated on a brand new lighthouse that was 150 feet above sea level, be praying for a storm to stop? They should have been perfectly safe. Even more peculiar is that there were no reported storms in the area on the 12th, 13th and 14th of December. In fact, the weather was calm, and the storms that were to batter the island didn’t hit until December 17th. The final log entry was made on the 15th December. It simply read ‘Storm ended, sea calm. God is over all’. What was meant by ‘God is over all’?" A box of ropes was found strewn across the rocks near the water and it was surmised that the keepers were trying to rescue the rope from the sea and a wave washed them away. But then why had the clock stopped in the kitchen? Was it such an emergency that all three keepers had to speed off leaving a chair on the floor? And why wasn't the third oil skinned coat used? And what of those entries with the bizarre weather revelations? Had some weird weather event only taken place on the island? Whatever happened, this mystery certainly is odd! On this day, October 17th, in 1346, the Battle of Neville's Cross is fought. It was fought during the Second War of Scottish Independence. King David II led his band of Scottish troops into battle and they numbered between 10,000 to 15,000 men. King Edward III had violated the Treaty of Male, which had ended the Hundred Year War by bringing troops into Normandy. The French were beaten and so David II marshalled his troops. Unfortunately, he did not take advantage of the element of surprise he had and his troops took their time moving forward. They camped outside of the city on October 16th and the next morning a small scouting faction was sent out. They were met by the English forces and were nearly all killed. A couple were able to get away to warn David II. It was too late to reach a better position, The English had the upper hand. The battle was tough and two factions fighting with David II took heavy losses and finally took off, leaving him to battle with his troops alone. They had some success hitting the English flank, but eventually were beaten and David II was captured. He was imprisoned in the Tower of London for eleven years. Lord Ralph Neville was one of the commanders of the English forces and he had a cross erected on the battlefield. That is where the battle got its name. The St. Augustine Lighthouse is actually a Light Station, meaning that the lighthouse is accompanied by several outbuildings. 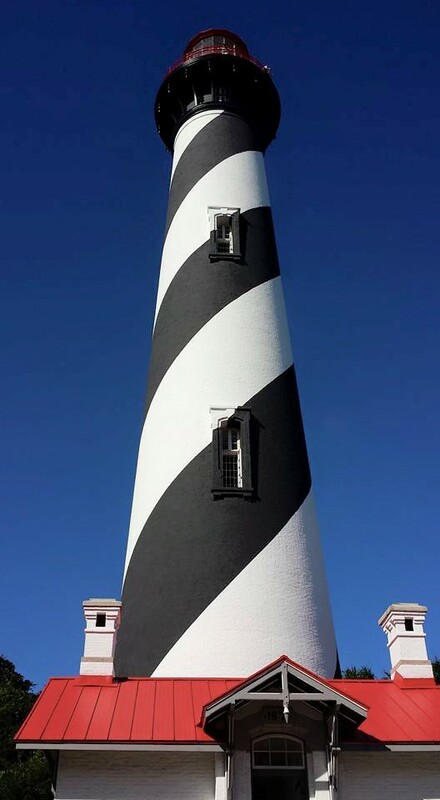 This is one of the tallest and oldest lighthouses in America. We visited with several History Goes Bump listeners to experience the Dark of the Moon Ghost Tour. While many families lived here without incident, there were a couple that suffered tragedy. And it is through those tragedies that spiritual energy seems to have continued on, even after all these years. We had what seemed to be an experience of our own. Come with us as we share that and the history and hauntings of the St. Augustine Light Station. We have discussed the history of St. Augustine in a couple of other podcasts. Obviously, this is one of our favorite cities to visit. Here is a brief refresher on the origins of St. Augustine. The city was founded in 1565, making it one of the oldest cities in both North and South America. It is America’s oldest city. The city took its name from the day upon which the city was founded by Pedro Menéndez de Avilés, the Festival of San Augustín. The city was originally founded to protect the Spanish trade route and the Castillo de San Marco was built to help facilitate defense with a small city cropping up nearby. St. Augustine found itself being constantly under assault. It was decided that a watchtower needed to be built, so that the people of the city would know when they were going to be attacked. They chose the spot where the modern day lighthouse now stands. The tower was built from wood in the 1500s. Several times it had to be rebuilt because wood was a bad choice for material. Later it was decided that what was really needed was a lighthouse. 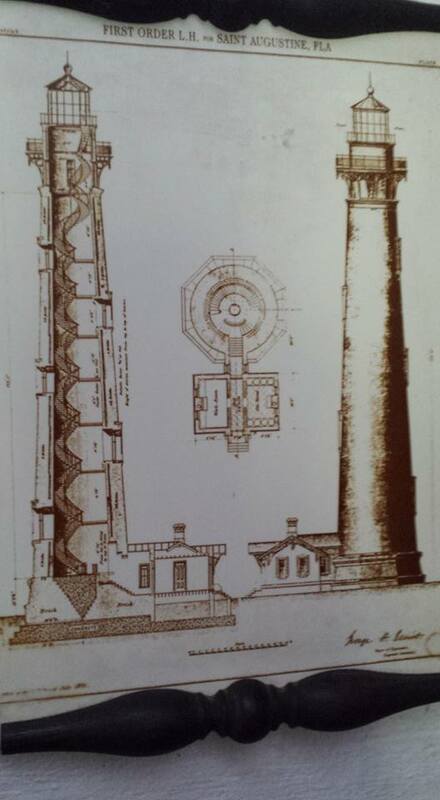 In May of 1824, the Coquina built lighthouse lit its light for the first time. It stood for several decades as the shoreline washed slowly away. Joseph Andreu and his wife Maria De Los Delores Mestre Andreu lived here before the Civil War. Joseph met tragedy one day when he decided to paint the outside of the tower and he fell to his death. Later on in the podcast, we will play one of the guides describing this horrific event. Maria took over as lighthouse keeper in 1860. She was the first female and the first of Hispanic descent to have that job. During the Civil War, a local harbor master named Paul Arnau and Maria removed the lens from the lighthouse to keep it from union soldiers and they buried it in the ground. Arnau was taken captive and under torture on a vessel, he revealed the location of the lens and the Union forces replaced it, so they could see the shipping lanes. Maria left after this and never returned. Or perhaps she did in the afterlife. By 1870, the government realized that the lighthouse was in danger and they began construction on the present day lighthouse in 1871, making sure to build a firm foundation in coquina. Iron and brick were used for the tower. The lighthouse was completed in 1874. It is St. Augustine's first and oldest brick structure still standing. Paul J. Pelz was the architect who designed the lighthouse. He also designed the Library of Congress in Washington, D.C. 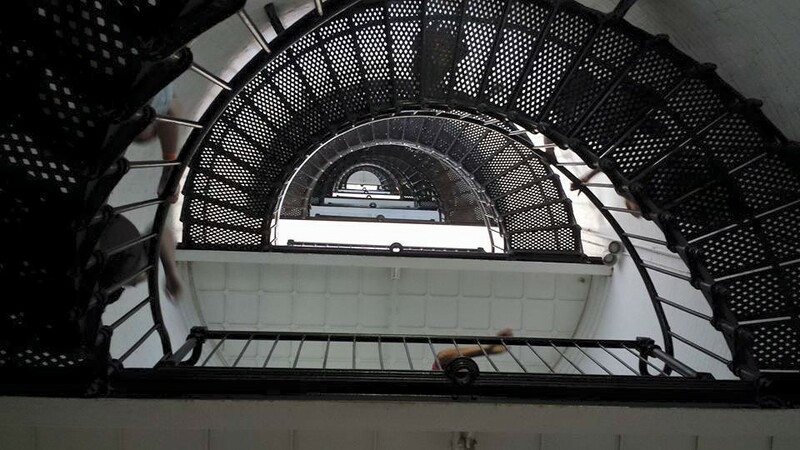 The lighthouse rises to 165 feet above sea level and contains 219 steps to reach the top. We climbed those steps both in the dark on the ghost tour and the next day when we returned in the light. The lighthouse is capped with a red lantern shaped dome that contains the original first order Fresnal lens. The lens is hand blown, stands nine feet tall and came from Paris, France. 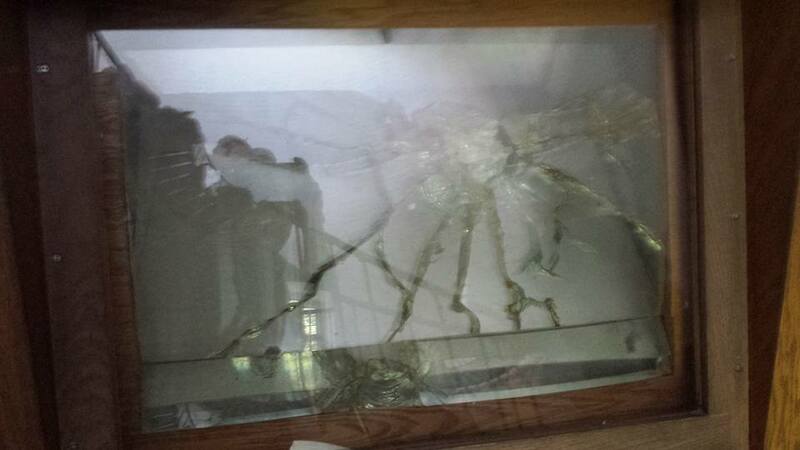 The lens was damaged in the 1980s by a vandal taking a potshot with a rifle. Head Keeper William Russell was the one to first light the torch in the lighthouse in October 15, 1874. So we were here 141 years after that event. The old watchtower was still standing nearby, but by 1880 it had been toppled into the sea. The tower on the inside is illuminated by nine windows and there are eight flights of cast iron spiral stairs that end in platforms, so that people can rest. This would have been needed by the keepers who had to hoist a can full of fuel weighing 30 pounds, up those stairs every two hours. This is no longer necessary today because the lighthouse is fully automated with a 1,000 watt bulb lighting the original beacon of the Fresnal lens. 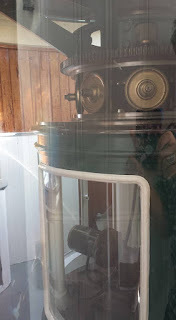 But before automation, lighthouse keepers were needed. The brick lighthouse keeper house that still stands today, was built in 1876. It was triplex that held two families and a single lighthouse keeper assistant. The first family to live in the house was the Harn Family. William A. Harn was originally from Philadelphia. He had served during the Civil War as Captain of the 3rd New York Independent Battery and fought in the battles at Fredericksburg and Gettysburg. His military service is what probably led him to be the first keeper to wear a uniform. He arrived in St. Augustine with his wife Kate and six daughters. For twenty years, Harn served as Head Keeper at the lighthouse. In 1886, Harn documented an earthquake that rocked the lighthouse in August of that year. He thought the tower was going to fall over. During his tenure, fuel was switched from lard to kerosene. The family had to deal with little amenities. Bathrooms were not inside the Keeper's house until 1907. Electricity was not installed until 1925. During World War II, the Coast Guard used the light station as a lookout and they built a garage where they could work on vehicles. Today, that building is used to help restore recovered nautical items and things damaged by water. By the 1960s, families no longer stayed at the station. The house was rented out and in 1970, it was nearly gutted by fire. Then it stood vacant for a while and was in danger of being bulldozed. In 1980, the Junior Service League of St. Augustine signed a lease and restoration efforts began. The Fresnal lens was first to be fixed. 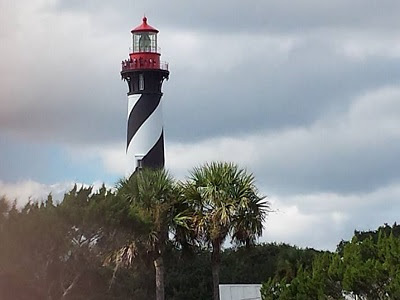 The rest followed and today the St. Augustine Light Station is a museum that hosts thousands of visitors. The building that visitors enter through today was built to be a cottage for a keeper. The keeper who had it built was unwilling to live in the keeper's house because of all the unexplained activity going on in the house. It would seem that some of the keepers and some of their family members have decided to stay on at the light station in the afterlife. 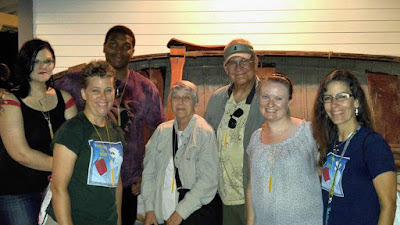 History Goes Bump, along with five of our listeners went on the Dark of the Moon Tour at the St. Augustine Light Station. Not only was the tour fun, but it was informative about the history of the location and had a couple of unique things about it. 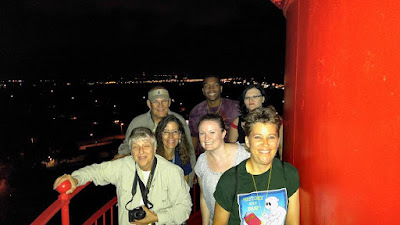 One was that we got to climb the lighthouse at night and view the city. The other was that we got to explore on our own for an hour or so. We've never been on a ghost tour that allowed that. The tour guides work for the lighthouse and so you know they care about the place and the funds go to keeping this wonderful piece of history alive. We had Dave and Ann Student with us, Julie Brammer, Jaran and Belle. We're going to play several sound bites that we recorded that night, featuring some of the haunting stories. Before we started the tour, we were informed of a little issue with the women's bathroom. Apparently, it is haunted. One of the more famous stories about the lighthouse goes back to its initial construction. The construction supervisor was Hezekiah Pittee and he had his children at the site with him. A railcar had been rigged to serve as a way to move supplies. The children found it to be quite handy for play and they would ride the car along the rail to where it stopped near the ocean. One day the car did not stop like it normally did and it went flying into the ocean, trapping three young girls. Only one of them was rescued. She was a neighbor girl. The other two girls were Hezekiah's children. Later, men laying bricks along the scaffold would hear children laughing. They would scamper down to warn the kids not to play with the railcar and they would find no children anywhere. In the 1960s, a man had rented the keeper's House and invited friends to stay with him. They woke up that night and found a girl in an old fashioned dress staring at them from beside the bed. The girl smiled at them and disappeared. We hiked through a nearby woody area and tried to figure out where the railcar line would have been. A guide showed us a picture taken in the woods of a white figure. The children are seen inside the lighthouse as well. Sometimes standing near the stairwell, wearing what people describe as old fashioned clothes. The guide showed us a picture of a shadow figure taken as it looked down over a railing. It was a very compelling picture.We wonder if perhaps the girls played a trick on us. We were mysteriously locked in the lighthouse while on free time. Denise left to go outside for a minute and when she came back, she couldn't open the door. Jaran and I tried opening the door from the other side, but it was locked tight. We thought the lock was broken and had automatically locked. A guide came with a key and informed us that the lock on the inside is not functional. It can only be locked from the outside with a key. How did that door lock itself? One of the guides also told us about muddy footprints that were left inside the Keeper's House. There were no barefoot children on the tour and the footprints would not wash away. They finally disappeared one day on their own. We saw the pictures of these as well. 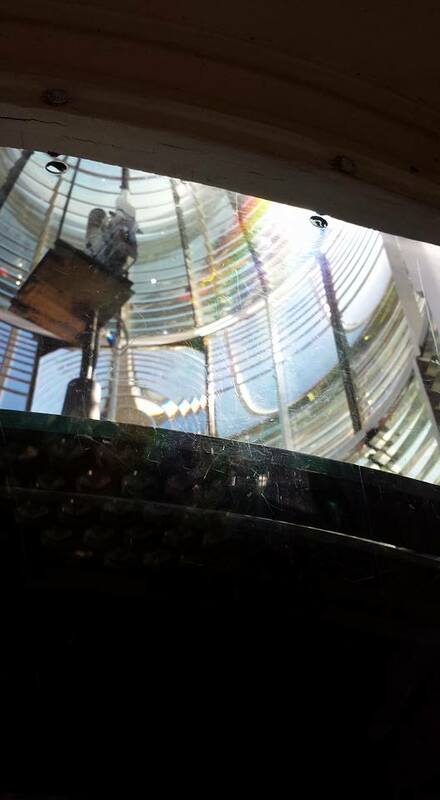 As we mentioned earlier, a keeper named Joseph died while trying to paint the lighthouse. He is here and his wife Maria has returned here as well. The guides told us some personal stories in regards to this and also more details on the way that Joseph died. It was not pretty. He hit many things on the way down and someone in his family more than likely witnessed the whole thing. Their ghosts many hang out on the first floor. We went down into the basement and were told about another Keeper named Pete. Pete liked to smoke down here and occassionally the sweet smell of his tobacco can be detected. He likes to put pressure on men's chests and to touch ladies on the legs. We heard stories from both our guide and later, Julie and Diane spoke with another guide who told us some pretty strange occurences that have happened with Pete. He seems to be able to control EMF Meters. Are the spirits of those who once watched over the lighthouse still here, continuing their watch in the afterlife? Are the ghosts of children playing in the woods and in the lighthouse? Were we locked inside the lighthouse by some weird happening with the lock? 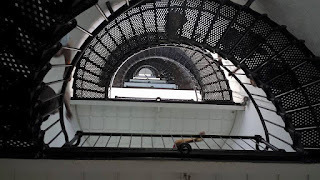 Is the St. Augustine Light Station haunted? That is for you to decide! Here we all are on top of the lighthouse! It all started in 1911, during World War I. Lonely soldiers' wives in the Hungarian town of Nagyrev decided to comfort their loneliness in the arms of the enemy. Allied POWs were being kept in the town and many of these women took them as lovers and some were impregnated. A midwife by the name of Julia Fazekas came to town that year. Her own husband had mysteriously disappeared. The women of Nagyrev came to her with their problems. Fazekas performed abortions on many of the women who were pregnant. And for the girls who came to her complaining that they had been forced to marry the men that were now off to war and that they wanted out to be with their foreign lovers, she helped teach them how to make arsenic by boiling flypaper and skimming the poison off the top of the water. When the men returned from war, they would eat food made with the arsenic and die. Now you might think that suspicions would grow when the village clerk started recording all these deaths as murder. But the village clerk did not record the deaths as murder because she just happened to be the cousin of Fazekas. The poisonings soon spread from the returning soldiers to other family members. These young women would off their parents as well since they considered them a burden. Every little problem was solved with arsenic. By the time a neighboring town caught wind of what was going on in Nagyrev, 300 people had been murdered by 50 different women. The idea that arsenic poisoning could become a fad certainly is odd! On this day, October 9th, in 1834, the Dublin and Kingston Railway opens in Ireland. It was the first railway system for the country and it was not completed without jumping through some hoops. Not everyone was keen on having the railway, particularly if it affected them personally. The line was going to run for six miles between Westland Row in Dublin and Kingstown Harbor in County Dublin. This meant having to cross through the property of two landowners, one of whom was Lord Cloncurry. Cloncurry was an Irish politician famously known for his adultery lawsuit against Sir John Piers. Cloncurry decided that he was going to make some elaborate requests of the railway company before he would agree to let them use his land. He demanded that they build him a foot bridge over the line so that he could cross to his bathing area. He wanted the bridge to have a Romanesque temple built on it as well, complete with a tunnel for him to go through and a cutting to maintain his privacy. The other landowner made a simpler request of a large sum of money. The Dublin and Kingston Railway ran on that October 9th with eight carriage cars pulled by a locomotive named Hibernia. The line remains today as a part of the DART line, which is the Dublin Area Rapid Transit. The Battle of Gettysburg is perhaps the most famous battle of the Civil War. President Abraham Lincoln even gave one of his most enduring speeches from Gettysburg and named it the Gettysburg Address. Nearly every American knows the first line, which reads, "Four score and seven years ago our fathers brought forth on this continent, a new nation, conceived in Liberty, and dedicated to the proposition that all men are created equal." Many men died during that battle and it was truly the turning point of the war and the beginning of the defeat of the Confederacy. Perhaps this is why the Battle of Gettysburg continues to this day. Not just as a part of re-enactments, but as ghostly battles continuing on the field. Countless witnesses have reported seeing the battle, hearing the sounds of the battle and bumping into ghostly soldiers. Today, we explore the history and hauntings of Gettysburg. The town of Gettysburg is a borough and the Adams county seat in Pennsylvania. In 1736, the land that now makes up the center of Adams County was purchased by William Penn's family from the Iroquois Indian tribe. At the time, the land was called Marsh Creek. The majority of the first settlers were of Scots-Irish descent that had fled Northern Ireland to escape English persecution. The French-Indian War led the residents of Adams County to become victim to several raids. One such event took place on April 5, 1758. The Jameson family was attacked at dawn. There were several children in the family, including a daughter, Mary who was around 16 at the time. Mary was captured and two sons escaped. Several other family members were captured and taken West. Only the fate of Mary's parents is known, they were murdered on the trip West. Two Seneca women later adopted Mary. She had multiple opportunities to return to the "white" world, but chose to remain with the Native Americans. Later in life she married two Indian chiefs and bore several children. Mary died in 1833 in her 90's. There is a life-sized monument dedicated to her memory at St. Ignatius Loyola Catholic church in Pennsylvania. The Bard family fell victim to a similar attack on April 13, 1758. Their home was raided and their infant was murdered. 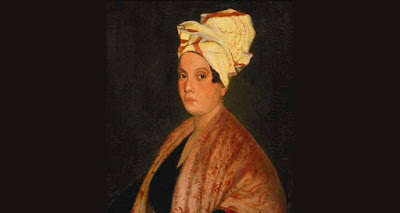 Catherine Bard was kidnapped, but her husband escaped and was able to bargain for her release. It's important to note that raids only occurred during the French-Indian war. At the close of the war, residents were able to again exist peacefully. In 1761, Samuel Gettys, an early settler of the area, opened a tavern. A short 25 years later, his son, James, had added 210 lots to the town which included a town square. Back then Gettysburg was part of York County. But in 1790 the residents decided to separate from York County. In 1800 the state legislature approved a new county. And so, Adams county was born, named after then president John Adams. The residents chose Gettysburg as the county seat and named the city for the Gettys family. In 1860, Gettysburg had a population of 2,400 people. As many as ten roads led in and out of town making a small, but successful economy possible. There were approximately 450 buildings that held merchants, banks and taverns. Also included were carriage builders, shoemakers and tanneries. Gettysburg was also home to several schools and other educational facilities. The burgeoning industries and road system led two armies to Gettysburg in the summer of 1863. When the summer of 1863 rolled around, the Confederate Army, led by General Robert E Lee, had achieved many victories. This convinced Lee that his army was ready to invade the north. This decision moved both armies from war-ravaged Northern Virginia toward Pennsylvania. Lee thought that once he invaded the North , and if by chance he was victorious, the tired and haggard North would pressure the Lincoln administration to end the war. 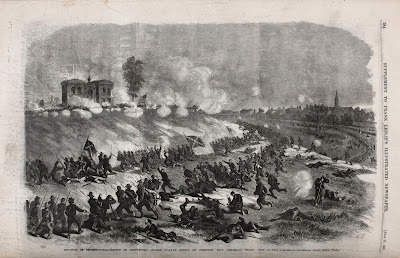 The 75,000 man Confederate Army was marching toward central Pennsylvania when on June 30 they learned that the 95,000 man Union Army led by George C Meade was pursuing them. Both armies arrived in Gettysburg on July 1st and thus began the Battle of Gettysburg. A battle that would last three days, but live on in infamy. General Robert E. Lee commanded the Confederate forces and General George Meade commanded the Union Army. Two small factions of Confederates headed to Gettysburg, led by Hill and Ewell, to gather supplies. Unbeknownst to them, a Union cavalry was already there, but they were few in number and the Confederates drove them back to Cemetery Hill. Lee saw the advantage his men had and he ordered Ewell, who had taken over for the mortally wounded Stonewall Jackson, to attack Cemetery Hill. Ewell was worried that there were too many Union forces and he delayed. Because of this delay, Union reinforcements were allowed to arrive that evening and fortify Cemetery Ridge all the way to Little Round Top. The following morning, July 2nd, Lee decided to attack the Union where it stood. He directed two of his leaders to attack from each side while he drove through the center. Lee had wanted to strike early, but one group of Confederates were not in position until 4pm. Daniel Sickles led his Union troops into holding the line. They stretched from the Devil's Den through a peach orchard and onto Little Round Top. The Confederates hit hard and Sickles was wounded. The Union lost ground. They retreated from the orchard and Devil's Den, but a Minnesota Regiment helped to hold Little Round Top. The battle was bloody and by evening, both sides had lost 9,000 men each. 35,000 in total had died over the two days, but there was more fighting to come. On July 3rd, General Lee made a critical decision that would be a bad one. He thought that the Confederates were close to victory based on the previous two days of fighting. He ordered a division of 15,000, led by George Pickett, to march three quarters of a mile in open field to hit the center of the Union forces. This plan would come to be known as Pickett's Charge. It began at 3pm, led by an infantry bombardment of artillery. The Confederates were hit from all sides and Pickett's division lost two thirds of their numbers. The survivors retreated and Lee regrouped for a Union counterattack. He expected it to come the next day, but it never did. Lee knew his army was decimated and on the evening of July 4th, he led his men back to Virginia. This battle signaled the end was near for the Confederacy. Several months later, the citizens of Gettysburg were still working through the aftermath of the battle. A prominent attorney, David Wills was tasked with the establishment and construction of the Soldiers National Cemetery. It was meant to honor and be the final resting place of the fallen Union soldiers. Wills was also responsible for the dedication ceremony and he invited president Abraham Lincoln to attend. The ceremony took place on November 18, 1863. And this is when Lincoln delivered the Gettysburg address. The city of Gettysburg and in particular, the battlefield where the Battle of Gettysburg was staged are thought to be some of the most haunted places in America. Tales of hauntings reach into the thousands. Bodies littered the streets of Gettysburg and many were dumped into mass graves. Those that were wounded and dying were taken to buildings throughout the town that were turned into makeshift field hospitals. Meaning that people died all over the town. Could this be why there are so many accounts of haunting experiences? Denise and I have a paranormal investigator friend, Linda Zimmermann, who was driving through the area with her husband. A mist was laying over the battlefield and she and her husband saw a man approaching them who they thought was a re-enactor. Until he disappeared. She couldn't believe she had witnessed this full bodied apparition. When Filming the 1993 film Gettysburg, several of the extras who were playing soldiers were sitting on the hill known as little round top. They were approached by another gentleman wearing a tattered and burned Union army uniform and who smelled of sulfur. He commented on how intense the battle had been, passed out extra rounds of ammunition, and walked down the hill. The extras assumed this was just another actor who had wandered up the hill, but when they brought back the ammo to the props department, the props folks said it had not come from them and identified the rounds as authentic and dating back to the mid 1800s. Could have just been an extra who happened to be a collector, but its still pretty odd. The Pennsylvania Hall building at Gettysburg college was used as a hospital during the battles and as a lookout. General Lee himself watched from the Old Dorm's cupola. One resident and his roomamte claim to have seen a shadowy figure in the cupola. This happened over several nights. Surely many men saw their end in the building. Two of the faculty were coming down on the elevator from the fourth floor to the first level. The elevator kept on going past the first floor and on to the basement. When the elevators opened, what the men described was a silent horror. They said they saw ghastly figures of bodies laying around and a nurse and doctor tending to them. Blood was splattered across the walls.There was no sound from the scene that laid before them, but they said the nurse looked at them with a pleading look on his face. They hit the buttons for the doors to close and made it back up to the first floor. Both men still claim to have seen this. There have been countless accounts of people hearing screams on the battlefields and cries of soldiers urging their men to "Charge!" from within the woods surrounding the battlefield. Orbs and Mists have been captured on film in many locations on the battlefield, especially at the Sachs Covered Bridge. This is where many have claimed to see a few different apparitions of soldiers. The battle poured into the town and skirmishes took place everywhere. The dead bodies laid in the street to the point that the smell of decay was overwhelming. Women would press handkerchiefs soaked in pepperment or vanilla to their faces to protect themselves from the smell. Those scents are still detected today as ghostly aromas. Many homes that were built on the edge of the battlefield are now owned by the National Park Service and there are claims of hauntings in these homes. The George Weikert House is one such haunted residence used by park rangers. There are tales of a door on the second floor that refuses to stay shut. One ranger nailed the door shut and still found it opened later. The attic plays host to disembodied footsteps. Another of these homes is the Hummelbaugh House, which is haunted by a Brigadier General and his dog. Brigadier General Barksdale was wounded on Seminary Ridge. He was brought to the front of Hummelbaugh House where he called out for water over and over. This was even after he had been given water. The General died and was buried on the property, but his wife soon arrived and had the body exhumed, so she could bring it home to bury her husband properly. She brought the General's loyal dog with her and he leapt onto the grave before the body was exhumed. They managed to pull him away, so they could unbury the General. The dog jumped back on the grave after the exhumation and refused to leave. The wife finally left the heartbroken dog who became a fixture at the farm. He remained there until he died from dehydration since he refused food and water. The General's cries are heard to this day and people report seeing not only the General, but also his dog. And an unearthly howl is heard sometimes on the anniversary of the General's death. In the town of Gettysburg, a childrens orphanage opened in 1860.The original owner had to move out of the area and left Rosa Charmichaels in charge. She was a sadistic woman and the orphanage was closed in the 1880s after it came out that she beat the children, tied many of them in the basement for days on end, and also was rumored to have killed some of them. They later found that the basement had been converted to a dungeon with torture devices and shackles on the walls for children to be chained up and, many times, left to die. There have been numerous accounts of people hearing disembodied children's voices and even feeling as though they are being physically touched. Fun Fact: Some people have claimed to not only see ghost soldiers, but full on ghost battles. As a matter of fact, Diane once heard the popular conservative talk show host Michael Medved share his story about camping out on the battlefield with a bunch of friends and in the middle of the night they were awakened by the sounds of battle. They found themselves in the middle of what seemed like a real life battle only they could see through the men. It was this experience that convinced this total skeptic that ghosts were very real. "The lock on that door sometimes rattles of its own accord, and meanwhile, up in the garret’s ensuite bathroom, a bloody mess that’s almost impossible to clean sometimes appears. The room was apparently a post for three Confederate sharpshooters during the conflict, and presumably at least one of them was seriously injured or killed there. In another upstairs room, a bereaved man is heard sobbing inconsolably, and seen carrying a child wrapped in a quilt. The door to the cellar often opens to an apparition carrying a wounded comrade down to the catacombs, where a voice is heard singing quietly. And in true Sixth Sense mode, the temperature suddenly plummets inexplicably.Other rooms feature less frightening occurrences. The McFarland Room often contains strange sounds, including unusually heavy breathing (and close-up, not from neighboring rooms). The Schultz Room is supposedly often visited by a solicitous midwife who tucks you in, and a little boy. Both are considered very benign presences, but apparently one of them smokes cigars." The battle that took place at Gettysburg seems to continue to rage on. The eyewitness accounts are too many to ignore. It is difficult to claim that people are just imagining these experiences. But as we always like to do, we leave it to the listeners. Is Gettysburg haunted? That is for you to decide!